For other uses, see Changeling (disambiguation). A changeling is a creature found in folklore and folk religion throughout Europe. A changeling was believed to be a fairy child that had been left in place of a human child stolen by the fairies. The theme of the swapped child is common in medieval literature and modernly reflects concern over infants thought to be afflicted with unexplained diseases, disorders, or developmental disabilities. A changeling is typically identifiable via a number of traits; in Irish legend, a fairy child may appear sickly and won't grow in size like a normal child, and may have notable physical characteristics such as a beard or long teeth. They may also display intelligence far beyond their apparent years, as well as possess uncanny insight. A common way that a changeling could identify itself is through displaying unusual behaviour when it thinks it's alone, such as jumping about, dancing or playing an instrument — though this last example is found only within Irish and Scottish legend. "A human child might be taken due to many factors: to act as a servant, the love of a human child, or malice. Most often it was thought that fairies exchanged the children. In rare cases, the very elderly of the fairy people would be exchanged in the place of a human baby, so that the old fairy could live in comfort, being coddled by its human parents. Simple charms such as an inverted coat or open iron scissors left where the child sleeps, were thought to ward them off; other measures included a constant watch over the child." D. L. Ashliman points out in his essay 'Changelings' that changeling tales illustrate an aspect of family survival in pre-industrial Europe. A peasant family's subsistence frequently depended upon the productive labour of each member, and it was difficult to provide for a person who was a permanent drain on the family's scarce resources. "The fact that the changelings' ravenous appetite is so frequently mentioned indicates that the parents of these unfortunate children saw in their continuing existence a threat to the sustenance of the entire family. Changeling tales support other historical evidence in suggesting that infanticide was frequently the solution selected." One belief is that trolls thought that it was more respectable to be raised by humans and that they wanted to give their own children a human upbringing. Some people believed that trolls would take unbaptised children. Once children had been baptized and therefore become part of the Church, the trolls could not take them. Beauty in human children and young women, particularly traits which evoke brightness or reflectivity, such as blond hair and blue or silver gray eyes, as these are said to attract fairies, as they perhaps find preciousness in these perceived traits. In Scottish folklore, the children might be replacements for fairy children in the tithe to Hell; this is best known from the ballad of Tam Lin. According to common Scottish myths, a child born with a caul (part of the amniotic membrane) across his or her face is a changeling, and will soon die (is "of fey birth"). Other folklore says that human milk is necessary for fairy children to survive. In these cases either the newborn human child would be switched with a fairy baby to be suckled by the human mother, or the human mother would be taken back to the fairy world to breastfeed the fairy babies. It is also thought that human midwives were necessary to bring fairy babies into the world. Some stories tell of changelings who forget they are not human and proceed to live a human life. Changelings who do not forget, however, in some stories return to their fairy family, possibly leaving the human family without warning. The human child that was taken may often stay with the fairy family forever. Feeling connected to the fate of a changeling, there are families who merely turn their changeling loose to the wilderness. Some folklorists believe that fairies were memories of inhabitants of various regions in Europe who had been driven into hiding by invaders. They held that changelings had actually occurred; the hiding people would exchange their own sickly children for the healthy children of the occupying invader. The Mên-an-Tol stones in Cornwall are said to have a fairy or pixie guardian who can make miraculous cures. In one case, a changeling baby was passed through the stone in order for the mother to have her real child returned to her. Evil pixies had changed her child, and the stones were able to reverse their spell. In Germany, the changeling is known as Wechselbalg, Wechselkind, Kielkropf or Dickkopf (the last both hinting at the huge necks and heads of changelings). confusing the changeling by cooking or brewing in eggshells. This will force the changeling to speak, claiming its real age, revealing its position beyond synchronicity. attempting to heat the changeling in the oven - perhaps a lie by capacity to endure present. Sometimes the changeling has to be fed with a woman's milk before replacing the children. In Ireland, looking at a baby with envy – "over looking the baby" – was dangerous, as it endangered the baby, who was then in the fairies' power. So too was admiring or envying a woman or man dangerous, unless the person added a blessing; the able-bodied and beautiful were in particular danger. Women were especially in danger in liminal states: being a new bride, or a new mother. Putting a changeling in a fire would cause it to jump up the chimney and return the human child, but at least one tale recounts a mother with a changeling finding that a fairy woman came to her home with the human child, saying the other fairies had done the exchange, and she wanted her own baby. The tale of surprising a changeling into speech – by brewing eggshells – is also told in Ireland, as in Wales. Various legends describe other ways to foil a would-be fairy kidnapper. One was to shout "Gairum augus coisricim thú " (I bless you) or "God bless you," which would cause the fairy to abandon the child it was trying to steal. Another possible tactic was to insert oneself into an argument over who would keep the child; shouting out "Give it to me" would trick the fairy into releasing the child back to a human. Changelings, in some instances, were regarded not as substituted fairy children but instead old fairies brought to the human world to die. Irish legends regarding changelings typically follow the same formula: a tailor is the one who first notices a changeling, the inclusion of a fairy playing bagpipes or some other instrument, and the kidnapping of a human child through a window. The modern Irish girl's name, Siofra, means an elvish or changeling child, deriving from Síobhra(í) meaning fairy(/fairies). The Aos sí, siabhra (commonly anglicised as "sheevra"), may be prone to evil and mischief. However, the Ulster folk song 'The Gartan Mother's Lullaby' also uses "sheevra" simply to mean "spirit" or "fairy". Belief in changelings endured in parts of Ireland until as late as 1895, when Bridget Cleary was killed by her husband who believed her to be a changeling. "Nothing under heaven could have a more beautiful face; but though between five and six years old, and seemingly healthy, he was so far from being able to walk, or stand, that he could not so much as move any one joint; his limbs were vastly long for his age, but smaller than an infant's of six months; his complexion was perfectly delicate, and he had the finest hair in the world; he never spoke, nor cried, ate scarcely anything, and was very seldom seen to smile, but if any one called him a fairy-elf, he would frown and fix his eyes so earnestly on those who said it, as if he would look them through. His mother, or at least his supposed mother, being very poor, frequently went out a-charing, and left him a whole day together. The neighbours, out of curiosity, have often looked in at the window to see how he behaved when alone, which, whenever they did, they were sure to find him laughing and in the utmost delight. This made them judge that he was not without company more pleasing to him than any mortal's could be; and what made this conjecture seem the more reasonable was, that if he were left ever so dirty, the woman at her return saw him with a clean face, and his hair combed with the utmost exactness and nicety." In the Anglo-Scottish border region it was believed that elves (or fairies) lived in "elf hills" (or "fairy hills"). Along with this belief in supernatural beings was the view that they could spirit away children, and even adults, and take them back to their own world (see Elfhame). Often, it was thought, a baby would be snatched and replaced with a simulation of the baby, usually a male adult elf, to be suckled by the mother. The real baby would be treated well by the elves and would grow up to be one of them, whereas the changeling baby would be discontented and wearisome. Many herbs, salves and seeds could be used for discovering the fairy-folk and ward off their designs. It was also believed that, in order to force a changeling to reveal itself, it must either be surprised into speech or made to laugh. In one tale a mother suspected that her baby had been taken and replaced with a changeling, a view that was proven to be correct one day when a neighbour ran into the house shouting "Come here and ye'll se a sight! Yonder's the Fairy Hill a' alowe." To this, the elf got up, saying "Waes me! What'll come o' me wife and bairns?" and made his way out of the chimney. At Byerholm near Newcastleton in Liddesdale sometime during the early 19th century, a dwarf called Robert Elliot or Little Hobbie o' The Castleton as he was known, was reputed to be a changeling. When taunted by other boys he would not hesitate to draw his gully (a large knife) and dispatch them, however being that he was woefully short in the legs they usually out-ran him and escaped. He was courageous however and when he heard that his neighbour, the six-foot three-inch (191 cm) William Scott of Kirndean, a sturdy and strong borderer, had slandered his name, he invited the man to his house, took him up the stairs and challenged him to a duel. Scott beat a hasty retreat. Child ballad 40, The Queen of Elfland's Nourice, depicts the abduction of a new mother, drawing on the folklore of the changelings. Although it is fragmentary, it contains the mother's grief and the Queen of Elfland's promise to return her to her own child if she will nurse the queen's child until it can walk. The Mamuna or Boginki is a Slavic spirit that exchanges babies (making them into odmieńce) in the cradle. The changelings left by the Mamuna were said to have a noticeably different appearance; a abnormally large abdomen, unusually small or large head, a hump, thin arms and legs, a hairy body, and long claws. Mamuna changelings would also get their first set of teeth prematurely compared to a human baby. In order to protect a child from being kidnapped by the Mamuna, the mother would tie a red ribbon around the baby's wrist, put a red hat on its head, and keep it out of the moonlight. Other preventative methods included not washing diapers after sunset and never turning their head away from the baby as it slept. Still, even if a child was taken by the Mamuna, there was a way to have her return the baby. The mother would take the changeling child to a midden, whip it with a birch stick, and pour water from an eggshell over it, all while shouting "Take yours; give mine back." Typically, the Mamuna would feel sorry for its own child and would return the human baby to its mother. Since most beings from Scandinavian folklore are said to be afraid of iron, Scandinavian parents often placed an iron item such as a pair of scissors or a knife on top of an unbaptised infant's cradle. It was believed that if a human child was taken in spite of such measures, the parents could force the return of the child by treating the changeling cruelly, using methods such as whipping or even inserting it in a heated oven. In at least one case, a woman was taken to court for having killed her child in an oven. In Sweden, it is believed that a fire must be kept lit in the room housing a child before it is christened, as well as that the water used to bathe the child must not be thrown out, as both of these acts prevent the child from being taken by trolls. In one Swedish changeling tale, the human mother is advised to brutalize the changeling so that the trolls will return her son, but she refuses, unable to mistreat an innocent child despite knowing its nature. When her husband demands she abandon the changeling, she refuses, and he leaves her – whereupon he meets their son in the forest, wandering free. The son explains that since his mother had never been cruel to the changeling, so the troll mother had never been cruel to him, and when she sacrificed what was dearest to her, her husband, they had realized they had no power over her and released him. The tale is notably retold by Helena Nyblom as Bortbytingarna in the 1913 book Bland tomtar och troll. (which is depicted by the image), a princess is kidnapped by trolls and replaced with their own offspring against the wishes of the troll mother. The changelings grow up with their new parents, but both find it hard to adapt: the human girl is disgusted by her future bridegroom, a troll prince, whereas the troll girl is bored by her life and by her dull human future groom. Upset with the conditions of their lives, they both go astray in the forest, passing each other without noticing it. The princess comes to the castle whereupon the queen immediately recognizes her, and the troll girl finds a troll woman who is cursing loudly as she works. The troll girl bursts out that the troll woman is much more fun than any other person she has ever seen, and her mother happily sees that her true daughter has returned. Both the human girl and the troll girl marry happily the very same day. In Asturias (North Spain) there is a legend about the Xana, a sort of nymph who used to live near rivers, fountains and lakes, sometimes helping travellers on their journeys. The Xanas were conceived as little female fairies with supernatural beauty. They could deliver babies, "xaninos," that were sometimes swapped with human babies– some legends claim this was in order for them to be baptized, while others claim that it is because the Xana cannot produce milk. The legend says that in order to distinguish a "xanino" from a human baby, some pots and egg shells should be put close to the fireplace; a xanino would say: "I was born one hundred years ago, and since then I have not seen so many egg shells near the fire!". In Wales the changeling child (plentyn cael (sing. ), plant cael (pl.)) initially resembles the human it substitutes, but gradually grows uglier in appearance and behaviour: ill-featured, malformed, ill-tempered, given to screaming and biting. It may be of less than usual intelligence, but again is identified by its more than childlike wisdom and cunning. The common means employed to identify a changeling is to cook a family meal in an eggshell. The child will exclaim, "I have seen the acorn before the oak, but I never saw the likes of this," and vanish, only to be replaced by the original human child. Alternatively, or following this identification, it is supposedly necessary to mistreat the child by placing it in a hot oven, by holding it in a shovel over a hot fire, or by bathing it in a solution of foxglove. Children identified as changelings by the superstitious were often abused or murdered. Two 19th-century cases reflect the belief in changelings. In 1826, Anne Roche bathed Michael Leahy, a four-year-old boy unable to speak or stand, three times in the Flesk; he drowned the third time. She swore that she was merely attempting to drive the fairy out of him, and the jury acquitted her of murder. In 1895, Bridget Cleary was killed by several people, including her husband and cousins, after a short bout of illness (probably pneumonia). Local storyteller Jack Dunne accused Bridget of being a fairy changeling. It is debatable whether her husband Michael actually believed her to be a fairy; many[who?] believe that he concocted a "fairy defense" after murdering his wife in a fit of rage. The killers were convicted of manslaughter rather than murder, as even after the death they claimed to be convinced they had killed a changeling, not Bridget Cleary herself. The Igbo people of eastern Nigeria traditionally believed that a woman who lost numerous children, whether stillborn or early in infancy, was being tormented by an ogbanje, a malicious spirit that reincarnated itself over and over again. One of the most commonly prescribed methods for ridding oneself of an ogbanje was to find and destroy its iyi-uwa, a buried object tying it to the mortal world. Many scholars now believe that ogbanje stories arose as an attempt to explain the loss of children with sickle-cell anemia, a congenital disease endemic to West Africa that afflicts around one-quarter of the population. Even today, infant death is common among children born with severe sickle-cell anemia, especially in areas of Africa lacking adequate medical resources. The similarity between the European changeling and the Igbo ogbanje is striking enough that Igbos themselves often translate the word into English as "changeling." The abiku was a rough analogue of the ogbanje among the related Yoruba peoples to the west of Igboland. The reality behind many changeling legends was often the birth of deformed or developmentally disabled children. Among the diseases or disabilities with symptoms that match the description of changelings in various legends are spina bifida, cystic fibrosis, PKU, progeria, Down syndrome, homocystinuria, Williams syndrome, Hurler syndrome, Hunter syndrome, regressive autism, Prader-Willi Syndrome, and cerebral palsy. The greater incidence of birth defects in boys correlates to the belief that male infants were more likely to be taken. Psychologist Stuart Vyse writes that modern parents have higher expectations of childbirth and when "children don't meet these expectations, parents sometimes find a different demon to blame." A condition known as regressive autism, where children appear to develop normally in their early years and then start to show symptoms of autism, can also be compared to marks of a changeling child. Several species of birds, fish, and insects regularly practice brood parasitism, or non-reciprocal offspring-swapping. Rather than raising their young on their own, they will lay their egg in another's nest, leaving the burden of raising their young on the unsuspecting parents, which are of another species altogether. More often than not, the invading species hatches sooner than its "step-siblings" and grows faster, eventually hogging most nourishment brought in and may actually "evict" the young of the host species by pushing them out of their own nest. The word "changeling" is often used in media to describe a shapeshifter, rather than a child swapped at birth. "The Changeling" is the first song on the album L.A. Woman by The Doors. "Changeling" is the only single released from the 1979 album Real to Real Cacophony by Simple Minds. "Changeling" is the first song on the 1999 album The Other Ending by independent Los Angeles band The Dagons. In Supernatural, the Winchesters have faced changelings posing as real children. In My Little Pony: Friendship Is Magic, changelings are insect-like ponies that disguise themselves as other creatures to feed off their love. They are recurring antagonists in the series, led by the tyrannical Queen Chrysalis, until she is deposed by the kind changeling Thorax, who reforms the changelings into creatures who share love instead. In Star Trek's Deep Space Nine, the Federation battles with a race of shape-shifting changelings in the Gamma Quadrant. The character Odo is a shape-shifter left in the Alpha Quadrant like European changelings were, and he fails to live up to the Founders standards. In the 2008 TV series Merlin series 3 episode 6, "The Changeling", features Elena, a princess set to marry Arthur in an arranged marriage, is inhabited by (as opposed to swapped with) a member of the Sidhe race, who will possess her once the marriage is complete, thus ensuring a Sidhe Queen in Camelot. In Amazon's exclusive show titled Lore, a show based on real people and events in which terrifying phenomena come to life, Season 1 Episode 3 focused on the story of Bridget Cleary, whose family believes she was taken by a changeling and does everything in their power to bring her back. In Trollhunters, Arcadia is infested by changelings who bring babies to the dark lands so that they can take the form of that human. The changelings in the series are trolls rather than fairies. In Outlander, Claire finds a baby in the woods and is told that it is a changeling (S1E10). Isaac Asimov's short story "Kid Stuff" (1953) features a member of a telepathic insect race which is the source of all the "little folk" stories. According to the creature, his people really like milk, and a number of them have indeed been rumored to use their powers in order to disguise themselves as infants and drink it as fresh as possible. In Poul Anderson’s The Broken Sword (1954), a wronged witch captures the newly born son of the king and, in his place, leaves a changeling. The real son of the king is taken away to elven lands and raised by elves. Zilpha Keatley Snyder's young adult novel The Changeling (1970) features a girl named Ivy who is convinced she is actually a fairy child. In Gregory Maguire's novel Confessions of an Ugly Stepsister (1999), Clara van den Meer believes that water-spirits kidnapped her and turned her into a changeling. Keith Donohue's novel The Stolen Child (2006) is about a group of changelings who live in a forest in western Pennsylvania. Changelings play a role in Frances Hardinge's novel Cuckoo Song (2014), in which the main character is believed to be a changeling and is thrown into a fire. Changelings play a major role in Foxglove Summer (2014), the fifth novel in the Rivers of London series by Ben Aaronovitch. As with other forms of magic and myth featured in these books, the phenomenon of fairies kidnapping human children and replacing them with changelings is depicted as actual, present-day practice. Switched (2012), by Amanda Hocking, is the first book in the Trylle series. It is an Indie YA novel about a girl who discovers she's a changeling. The Good People (2016), by Hannah Kent, is based on the story of 19th-century "changeling" Michael Leahy. The Changeling Sea by Patricia A. McKillip centers around a Changeling prince with ties to the Undersea realm beneath the waves. Lionel Shriver uses the term 'changeling' to describe Kevin, the eponymous murderer, in her novel We Need to Talk About Kevin. In 1980, The Changeling was released, featuring the story of a man who took on the identity of a murdered boy and the man who discovers this when he begins living in the house where the murder took place. Angelina Jolie starred in Changeling (2008), in which she portrays Christine Collins, whose son was kidnapped in 1928 and replaced with another boy. In the 2015 anthology horror film A Christmas Horror Story, one of the stories involves a couple who mistakes a changeling for their own son and brings it back home with them. In Star Wars for the Family Computer, Luke fights four changelings assuming the appearance of Darth Vader. When attacked once, they reveal their true forms, such as a scorpion, a shark, a pterodactyl, and a Wampa. In Magic: The Gathering, the term is used to define a creature that has every single creature type within the game. It also has a card named Crib Swap, which reflects the switcheroo aspect. Both the original and rebooted World of Darkness settings by White Wolf Games included one game line titled focused on changelings: Changeling: The Dreaming in the original World of Darkness, and Changeling: The Lost in the New World of Darkness. In both games, player characters were changelings, though the approaches differed between the two games: in the first, characters were fae souls reborn into human bodies, a practice begun by the fae to protect themselves as magic vanished from the world. The latter game focused on the folklore concerning mortals kidnapped by faeries and subsequently returned to the mortal world. In StarCraft II: Wings of Liberty, the changeling is a zerg spy produced by the overseer. The Changeling spawns as a Zerg-looking unit, but upon seeing an enemy unit or building it will automatically transform into the basic unit of that enemy's race. Once disguised, the Changeling takes on the enemy's own color and will no longer be automatically attacked by the enemy's units, allowing it to infiltrate enemy territory unsuspected. In Fire Emblem Heroes, an antagonist named Loki is most likely a changeling and she spend the entirety of Book 1 in the guise of Bruno (Veronica's brother), Sharena, Alfonse before deciding the stick with disguising herself as Anna, her true form won't be revealed until Book 2. Loki disguised herself yet again in the intro for the Tempest Trial Mini entitled "Shrouded by the Storm" this time as Fjorm, the Princess of Nifl until her cover was blown when the real Fjorm shows up. The game Button Men features a Changeling character as a rare button in the Soldiers set. Changelings are a playable race found in the Dungeons & Dragons add-on Wayfinder's Guide to Eberron. ^ a b c Mac Philib, Séamas (1991). "The Changeling (ML 5058) Irish Versions of a Migratory Legend in Their International Context on JSTOR". Béaloideas. 59: 121–131. doi:10.2307/20522381. JSTOR 20522381. ^ a b c Ashliman, D. L., "Changelings", 1997. Frenken shows historical pictures of the topic (newborn and the devil): Frenken, Ralph, 2011, Gefesselte Kinder: Geschichte und Psychologie des Wickelns. Wissenschaftlicher Verlag Bachmann. Badenweiler. p. 146, 218 f, 266, 293. ^ Wentz, W. Y. Evans (1911). The Fairy-Faith in Celtic Countries. Reprinted 1981. Pub. Colin Smythe. ISBN 0-901072-51-6 P. 179. ^ a b c d Jacob Grimm: Deutsche Mythologie. Wiesbaden 2007, p. 364. ^ a b c Jacob Grimm: Deutsche Mythologie. Wiesbaden 2007, p. 1039. ^ a b c Ludwig Bechstein: Deutsches Sagenbuch. Meersburg, Leipzig 1930, p. 142 f.
^ Jacob Grimm, Wilhelm Grimm: Deutsche Sagen. Hamburg 2014, p. 126 f.
^ Jacob Grimm, Wilhelm Grimm: Deutsche Sagen. Hamburg 2014, p. 134 f.
^ a b c Folklore of Northumbria by Fran and Geoff Doel, The History Press, 2009, ISBN 978-0-7524-4890-9. Pages. 17–27. ^ a b c d The Borderer's Table Book: Or, Gatherings of the Local History and Romance of the English and Scottish Border by Moses Aaron Richardson, Printed for the author, 1846. Page.133-134. ^ Spence, Lewis; Cannell, W. Otway (6 January 2010). Legends & Romances of Brittany. ^ "Wielka Księga Demonów Polskich. Leksykon i antologia demonologii ludowej". Lubimyczytać.pl. Retrieved 8 February 2016. ^ a b c "Mamuna / Dziwożona". Slawoslaw.pl (in Polish). 15 July 2015. Retrieved 6 December 2018. ^ "Scandinavian Changeling Legends". www.pitt.edu. Retrieved 6 December 2018. 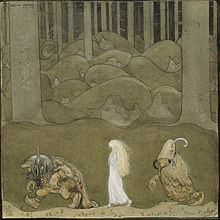 ^ The tale is notably retold by Selma Lagerlöf as Bortbytingen in her 1915 book Troll och människor. ^ Sánchez Vicente, Xuan Xosé; Cañedo Valle, Xesús (2003). El gran libro de la mitología asturiana [The great book of Asturian mythology]. Ediciones Trabe. ^ Wirt Sikes. British Goblins: The Realm of Faerie. Felinfach: Llanerch, 1991. ^ "The Enduring Legend of the Changeling - CSI". www.csicop.org. Retrieved 1 February 2019. ^ Vyse, Stuart (2018). "The Enduring Legend of the Changeling". Skeptical Inquirer. Committee for Skeptical Inquirer. 42 (4): 23–26. ^ Duff, Kim. The Role of Changeling Lore in Autistic Culture (Speech). Presentation at the 1999 Autreat conference of Autism Network International. ^ "Changeling (Legacy of the Void) - Liquipedia - The StarCraft II Encyclopedia". wiki.teamliquid.net. Retrieved 27 October 2016. ^ "The Changeling Race for Dungeons & Dragons (D&D) Fifth Edition (5e)". D&D Beyond. Retrieved 4 December 2018. "Changeling" . Encyclopædia Britannica. 5 (11th ed.). 1911.